This dish is comfort food to the Japanese during the winter. 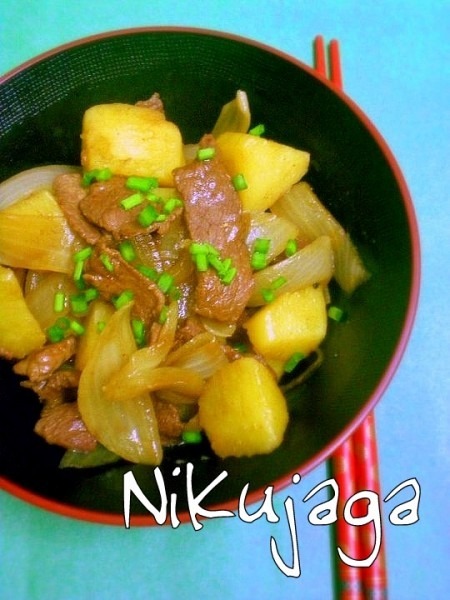 My Japanese proficiency may be next to none but beef is ‘Gyuniku’ I think, while potatoes are called ‘jagaimo’. So combine the two and you have ‘Nikujaga’ (for all the Japanese out there that wish to dispute this claim, you are welcomed to do so…I will be quick to confess I’m just speculating here, but I wouldn’t mind if someone uncovered the real fact for me). This dish was incredibly easy to make and I am making it a permanent menu for my family. My methods may not be the real thing but it works for me. 1. Heat up oil in a wok and stir fry the beef for few minutes. Add your potatoes and stir fry. Squeeze the juice of the ginger into the mixture. 2. Pour in your dashi stock until the meat and potatoes are about half covered. 3. Let it simmer covered for 3 mins, then open the lid and pour in the mixture of sugar, sake, soy sauce, mirin and sesame oil. Add white pepper. Stir it around and cover again. The heat inside the wok should be able to cook the potatoes all the way through. 4. Turn the heat down to low and simmer for about 20 mins or until potatoes are tender and very little liquid is left. Before the last 10 mins, add your onions and cover again. 5. When the onions are just about softened, they’re ready. Eat with plain rice and some miso soup.